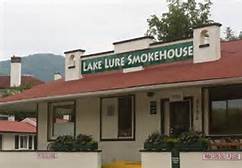 Located next door to the historic Lake Lure Inn. Specializing in BBQ smoked dishes such pork BBQ, beef brisket and chicken. They offer appetizers, A assortment of burgers and sandwiches, soup and fresh made hushpuppies. They also have a full breakfast served daily. Debbie tried the smoked ¼ chicken, ranch style beans and collard greens. I had the BBQ chopped pork, fries and slaw. Everything was good, good portions and plate presentation. Great service!